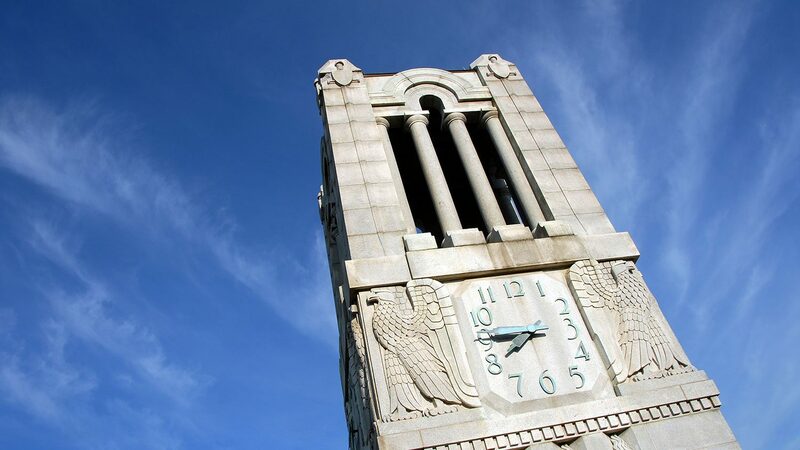 Mary A. Dolan had no direct connection to NC State’s Department of Biological and Agricultural Engineering (BAE). But after just a few moments of hearing BAE alumna Sepi Saidi’s story, Dolan was inspired to support the department in a unique way. Saidi, CEO and president of SEPI Engineering and Construction, spoke at the CALS Awards Banquet as the 2016 BAE Outstanding Alumna. Her story of growing up in Tehran, traveling to the United States for a better education, and starting her business as a woman immigrant engineer moved Dolan. This led to Dolan’s decision to create an endowment with the inheritance willed to her by neighbors Jean and Mort Powell, whom she considered her North Carolina family. The endowment will create a merit-based scholarship in memory of the Powells. 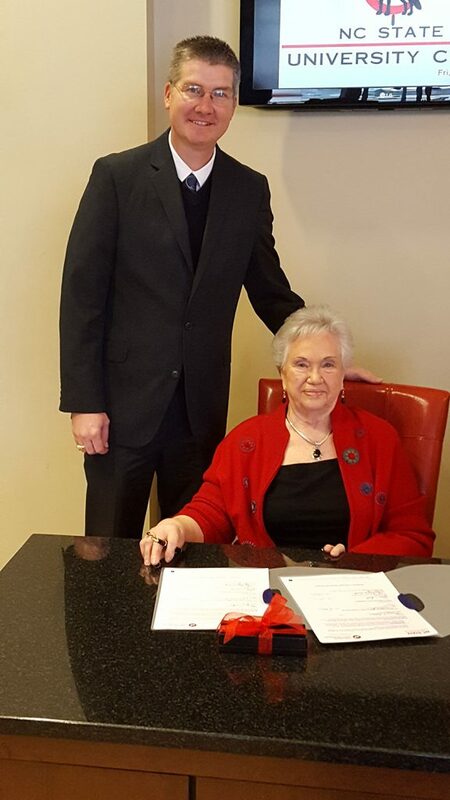 BAE Department Head Garey Fox with Mary A. Dolan at her endowment-signing ceremony. The Jean and Mort Powell Jr. Biological and Agricultural Engineering Scholarship will go to a student involved in Women in Science and Engineering, the Society of Women Engineers, or Sigma Alpha Professional Agricultural Sorority. “This endowment acknowledges our department’s commitment to training high quality students who are creating engineering solutions for sustainable agricultural, biological and natural systems,” notes Garey Fox, head of the Department of Biological and Agricultural Engineering. Women engineers are still considered an underrepresented group in engineering. BAE typically maintains greater than 25 percent female enrollment. Supporting women in engineering is also one of Saidi’s passions. At the 2016-2017 BAE Student Awards Banquet, she spoke about the importance of encouraging women to open their own doors, giving them a chance, and respecting their ideas and perspectives. As the keynote speaker, Saidi talked about growing her company — an engineering and design firm focused on innovation and sustainability — from two employees in 2001 to a thriving firm with 250 on staff today. Despite starting her company in one of the most uncertain financial times in history, she was determined that her company would not participate in the recession. “I had faith. One way or another, we were going to turn enough stones,” Saidi said during her keynote. Eventually she landed a contract to build the first toll road in North Carolina. It was Saidi’s contagiously optimistic spirit that inspired Dolan to reach out to the university and create the Jean and Mort Powell Jr. Biological and Agricultural Engineering Scholarship. Dolan’s late husband, Robert J. Dolan, was a professor in the Department of Adult and Community College Education at NC State. “I never went to college, but I have a Ph.D. in the ups and downs of life,” Dolan reflects. When times were hard, she always had her university community to lean on, she said. At the time her husband became ill, the two had only lived in Raleigh for about seven years. But they had a support system in the Powells and right here at NC State. You can make a difference in the lives of CALS students. Give today! 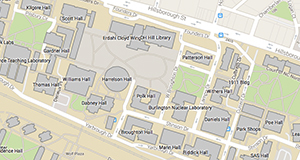 Dean Linton recently announced that six outstanding faculty members have been named winners of one of the college's highest awards.